The theme of the issue is RFPs (Request For Proposals.) 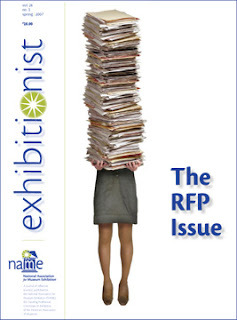 How did I end up guest editing an issue of The Exhibitionist about RFPs?!?! I can’t stand most of the paperwork associated with the exhibits process – a lot of it seems devised by lawyers and bean counters to thwart creativity and excellent end products, not encourage them. However, one thing that motivates me even more than my distaste for paperwork is the need to finish a project once it gets started. From the very start of the four years I served on NAME’s board, I kept hearing about a mysterious, unfinished document called “The RFP Cookbook.” I came to understand that over nearly 10 years some of NAME’s, and the museum field’s, most thoughtful and creative practitioners had been writing, re-writing, and trying to assemble this definitive tome regarding RFPs. Well, for various reasons, The RFP Cookbook never seemed to be able to get off the ground, and frankly, after hearing about it for four years, I wanted to help pull the project together or drive a stake through its heart. After my fellow board members took the sharpened stick out of my hands, I became a somewhat reluctant, at least initially, editor of this collection of practical articles about the many facets of the RFP process. Even if you aren't already a member of NAME (hint, hint) check out the downloadable examples. You never know when YOU might be called upon to put together an RFP!